Every Thursday I rush across town from my Program Building to the High School, keeping an open mind about the PLC format that our faculty meetings are taking. Traditionally, our meetings left me wondering where I fit into this faculty, a group who focuses on AP (advanced placement), ivy league college entrance, standardized test scores, student behavior, attendance and tardiness. At the beginning of the school year we were divided up into two PLC groups, one with our curricular department and one with grade level groups. We are charged with sharing strategies we are using in the classroom that have been adopted school wide. I was kind of excited! Here it was, an opportunity to connect with a staff I am part of but separated by due to the nature of my off campus program. Let me put in the disclaimer here—our principal is FANTASTIC, she “gets”it” and there are many faculty members who are awesome teachers in their specialty. This ramble of mine is my feelings about being a nontypical high school teacher who is teaching nontypical students! Through our weekly PLC meetings, I have become enlightened that my students are equal in the utilization of strategies. They utilize them in different settings or with different materials that are not typical to a high school student in a classroom, but they use them! An example of my enlightenment came during a PLC sharing of Marking the Text , a strategy that came from the school wide use of AVID. 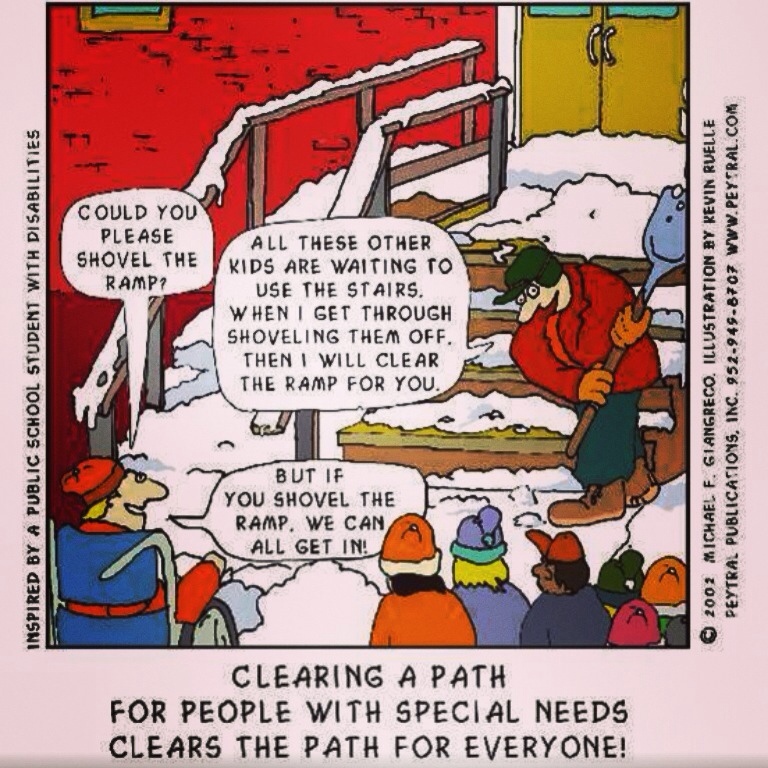 I missed this presentation of the strategy a few years ago, because I was not included in school wide usage of the program, due to the nature of my mobile teaching of young adults with special needs in the workforce. I did not, nor ever will utilize the AVID program. There seemed to be a misconception at the time that “Ruth’s” kids do not need this approach to learning about reading. I too was not paying attention when it was first presented at a two-hour long faculty meeting in lecture format and did not sign up for any of the PD. In our new PLC format I have come to realize that this strategy CAN and IS being used by my students. AND the kicker is they have been utilizing the strategy in the real world as adults. I realized this as I watched them read the job ads online and in newspapers, highlighting key vocabulary and then discussing it in our daily Job Club session. My students are able to pull up a website for a major employer, using their fingers on a touchscreen device, highlight the important info they need to apply for a job, prepare for an interview and become knowledgable about the employer. We have been utilizing this strategy digitally for quite some time, while the General Education population is still using pencil and paper! The PLC gave me a name for what we were doing, which seems to happen quite a bit, I am practicing effective strategies in my classroom from instinct or common sense and then learn there is a name for it! I was excited when it was my turn to share with other General Education 12 Grade teachers how we were using the strategy with Ipads, personal phones and other digital media in the mobile world outside the high school walls. The recorder took notes and then we quickly moved on to the next thing on the standardized PLC agenda, leaving me feel a bit empty—I was hoping for more collaboration and real connections with my peers. As these weekly meetings are continuing, I am learning to listen more, share less verbally and the use pictures of my students in the real world to share what I do, which is helping. There has een a small spark–a few of the teachers I have known for many years started asking questions. Like “What is Autism?” “How can I get help with teaching a student with Aspergers?” This spark is growing and one teacher is asking for resources. Although, this empty feeling keeps coming up in my professional live. When I am with a group of high school teachers and talk about my “kids” or get excited about a new thing like opening doors for them at our local community college, eyes glaze over. If I lived in a larger geographical area (not a 2 by 4 mile island) and closer to a university (not 4 hours away on one road to the nearest Walmart!) I might have more opportunities to collaborate with people who are doing what I do. Colleagues who take Transition seriously, people who know that students with disabilities CAN go to college and are making it happen. Sometimes I feel like I live in the backwoods instead of Paradise! Therefore I have been reaching out to the wide open space of the digital world and the internet! Strategically trying to build a PLN (Personal Learning Network). My goal is to develop connections and resources that will carry me into retirement from Public School System. I do not want to stop doing what I do, but would like to do it on a wider platform. So I am learning to Tweet! To dust off this blog and to set up our Program Blog as a class project for my darling young man who wants a job in Technology building websites and games. Learning about Edublogs and moving the Program Blog from WordPress. Learning to manage digital information is a full-time job and I think I am getting the hang of it. Trying not to feel overwhelmed and like I have to take immediate action on everything I discover. So to connect with me outside this Blog I am now on Twitter @ononeroad and have making a Facebook titled On One Road as a goal, until then you can connect via my personal page. Any tips, tricks and just general comments would be appreciated! I am quite distracted by shiny objects! As one flies across my screen I will follow it to other links and then forget about what I was studying to start with!!!! Here is a summary of my connections I have been utilizing since I started this PLN project! Blogging through the Fourth Dimension Great BLOG! And I rediscovered Edutopia! It has been a productive and renewing Christmas Break so far. Now if only the weather would clear up—-I am ready to go enjoy my last week off of school in Paradise! Assessable for All serves All!! So true! what is good for one will be good for all! Humbug! Why I Hate The Holidays In Schools. Loved reading this! From @TeachThought in my Twitter feed this am via @CoolCatTeacher. I personally LOVE my Starbucks gift cards, mugs and travel cups that I am utilizing this morning as I head out into the after Christmas “rush” on our island. The leisurely coffee time on my screen porch, reading blogs, catching up on Twitter Feeds, has introduced me to these great writers, both of which are going to become awesome resources in 2014. There is probably a “quick” stop into the classroom in this journey. It seems as if a few good nights of sleep have cleared my mind and the creative juices are starting to flow. 2014 is going to bring some awesome things to our little building. Each year in my home the play lists for the season come from A Very Special Christmas albums on my iTunes, streamed throughout each room. The Holidays are bitter sweet. Being blessed with a Public School schedule with two weeks off, makes this job worth all the late nights, long hours and emotional investment into the lives of young adults with special needs. Yet there is a draw back, the investment creates a bit more stress then the typical classroom teacher experiences. I am not done at the end of the contracted duty hours. It has been my choice to become fully invested in this career for the past 27 years of my life. A choice that is brings consequences that affect me profoundly at this time of year. A longing to travel and skip Christmas has been inside me for the past few years, yet I do not give in. I plug away, put up the tree, ship the gifts, try to coordinate schedules with my small family in TN. and push the Bah Humbug feeling away. I operate on what Christmas is “supposed” to look like. The three weeks between Thanksgiving and Christmas in my business are the hardest, in my opinion. The return to the classroom after Thanksgiving is like a hard sprint, put my head down and run to Dec. 20th, sliding into my bed to sleep for two days! After that I wake up and work on recovery in order to return on Jan. 6th for the downhill slide to Spring Break. Christmas and its goodwill sometimes gets set aside in my personal life in order for me to make it through and that makes me sad. I have neglected my small family, missed life events (Graduations, Military Awards Ceremonies, Birthdays) of my nephews because I was unwilling to take the time away from the students (substitutes are not easy to find for this group and sometimes destroy what took months to accomplish). Until a few years ago I did not have funds to travel from this island I choose to live on, which made it hard to be involved in the families lives in Nashville. My choices to focus on this career, have consequences today. Now that I am slowing down and can take the time to be with my nephews and their children, have some funds to be able to travel, they are adults and have full lives, responsibilities and Aunt Ruth is not someone they know well. Their priorities are with their families now, as it should be. That is ok, that is the natural way of it and I rejoice for the two boys who will carry on our family legacy. I redirect my bittersweet feelings and dive into the what is going on with my students, savoring the time with them and enjoying Christmas through they’re loving spirits. My adult students have the childlike wonder of the season, and are learning the adult life lessons of responsibility. They are continuing to go to the job sites, do their grocery shopping and all of their college assignments, things that are not as motivating as Santa Claus and Christmas Cookies! As a leader, I feel that it is important to keep us moving forward with the IEP goals, keeping in mind that a two week break is on the horizon. Therefore the focus is on lesson plans that are highly engaging for students and staff. This has yielded some awesome student gains in these past few weeks! While making plans for community based vocational sites and college access, the two week break must be planned for also. The business world that the students interact with is sometimes confused when we stop attending the internship or community learning site for two weeks. It is so important to maintain our relationships with them for the benefit of the students, but so hard to do on this school schedule. Sometimes students choose to participate in the “office parties” on their job sites and need support. It is always fun to witness the communication breakthroughs that emerge via the interaction with natural supports. The relationships become solidified via the Holiday Spirit the students exude. Keeping my emotions in check, there are some very important decisions that I am making that will affect the quality of my life in the near future, along with affecting this program that has been an extension of me for the past 7 years. In the recent weeks I have learned that the magic age of 55 gave me some options in my retirement funding. It seems that the 403b that my father insited that I start many years ago is going to come in handy. At 55, it can be rolled over into the FRS system to “buy” the three years of bad choices I made during an attempt to live in Ohio. This means at in June 2014 grand total of my FRS service credit will be 28 years! Which means I work 2 more years and in June 2016 I can retire with 30 years of service or enter DROP. This is the best Christmas Present ever! I can count on one hand the time I have left to serve in the Public School System! This does not mean I will “retire” from my “kids” It does meant that I will have choices in how, when and where I serve. As I sit here on my front porch, reflecting on the implications of this news, I fight off the temptation to run away from Christmas. I find joy in knowing that the my service time has helped many others, yet also come to a new resolution that the next two weeks will be about taking care of me. Taking care of my needs for play and healthy eating. Taking time to reflect on how to use the next two years to leave a legacy that the Public School System can sustain if it chooses to. Taking time to create an action plan that will enable me to share all the knowledge gleaned from my students with others. Counting the blessings, feeling the warm island breezes and taking time to watch the sunrise is driving the Bah Humbugs away! After many months of ignoring a stirring in my soul, doing everything I can to keep the longings for change in check, yesterday it was brought to my attention by someone I admire and respect deeply, that I am overlooking an opportunity that can answer the calls of my heart AND make huge differenced in peoples lives. Tears came to my eyes as her words were felt by my heart—the inside core of me that had been longing to be heard. I realized how selfish I have been in not asking for help. This article was published in my hometown newspaper, The Jupiter Courier, causing attention to be brought to the SUP in Special Olympics movement that is sweeping across Florida and beyond. There have been other articles, social media and press about all of this—-but this one hit me hard. I left Jupiter as a young girl, not well-known, a young girl who was always in the background in high school and who was known for not making very good choices socially. The contacts that came from this article were a bit overwhelming–personally and professionally. Yes, I am from Jupiter originally and my childhood is on the Loxahatchee, but my home and heart reside on this island of the most giving people I have ever met! On our island, when someone is in need, there is an uprising of help, there is always an awareness of each other and even when we do not agree, we work to make a difference, we strive to accept each other. This article represents how a dream I had a few years ago has gotten much bigger! Each time highlights and success stories like these are published I am so proud, yet it is getting overwhelming for me—a simple teacher who does not know how to manage all of this and does not seek public recognition. 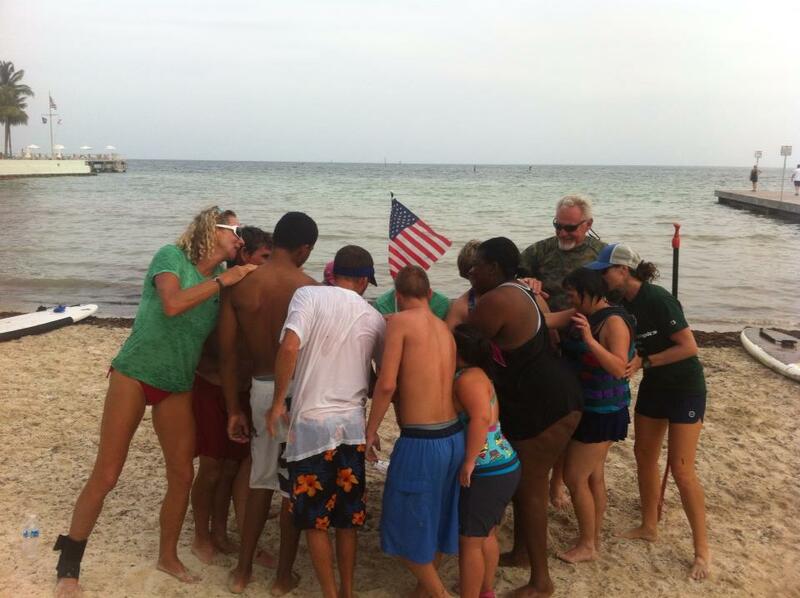 This dream has grown beyond its intention of providing access to the water via a paddleboard to my Special Olympic athletes here on our island of Key West. It is a good thing that it has grown, but it also has distracted me from my island, myself and my peeps! Yesterday’s conversation reminded me to bring it all back home to our island–where the magic happens. When people and Special Olympic Coaches from around the State of Florida, along with people in other states, email and call me, wanting to get programs going in their areas, I feel pulled. My day job as a teacher and the program I run has its responsibilities and now more keeps piling on. The inner conflict of trying to handle something I know nothing about–business, press and the next steps for this dream — have caused me to neglect my own health and wellbeing. Until yesterday, I truly thought that this conflict had to be fought alone. The TIPPING POINT–brings me to the realization that I MUST ask for help in figuring out how to change my life so I can stop adding more to the plate–some decisions need to be made and I need help in figuring out how to do that. In overlooking and undervaluing myself, I have also undervalued the people and organizations who have joined in the dream, to make a difference in the lives of people on our island. Realizing that, makes my resolve to implement changes even stronger. The TIPPING POINT —-the realization that the dream is now a reality and there must be some definition to it all. Today I feel some hope that it is possible to create some space in my life–I really want to be the best Ruth I can be so I can continue to make a difference for my peeps! Teaching is a highly interpersonal profession and constantly engaging in relationships means that teachers are always at the intersection of two or more histories of positive and negative experiences coloring each individual’s thoughts, feelings, and actions. via How Can Teachers Overcome Depression and Strife? – Living in Dialogue – Education Week Teacher. Asking myself how to get out of this intersection. How to serve and do what I am meant to do and still move forward.